Note: article may be updated over coming days. Jan 18: Sydney swelters setting new record temperature of 45.8C Friday 18 January while fires across southern states continue to burn out of control. Jan 5: A heatwave covering 70 per cent of Australia that started on January 3 has sparked catastrophic bushfires. Tasmania has so far been the most devastated by fire with more than 100 houses and businesses razed, the Tasman peninsula cutoff, without power, and thousands evacuated by boat to Hobart. The Temperature soared in Hobart setting new records for highest daily minimum overnight temperature of 23.4C and a new maximum temperature of 41.3C. Other states are also experiencing bushfires, but have so far brought the fires mostly under control. The heatwave is expected to last over a week with elevated temperatures particularly in inland areas. It is very unusual that a heat wave covers such a large area of the continent at one time, according to Karl Braganza, manager of climate monitoring at the Australian Bureau of Meteorology. Australia's weather has switched to hot and dry after one of the wettest two year periods in Australia's history influenced by an extremely strong La Nina event. 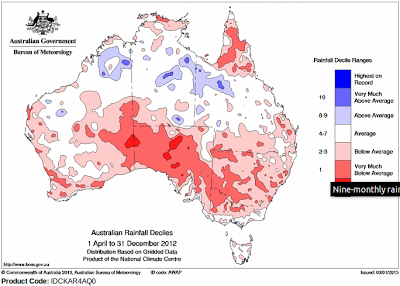 Over the southern winter and spring weak El Nino conditions have caused below average rainfall across much of Australia with a heatwave and above average temperatures in early Spring. 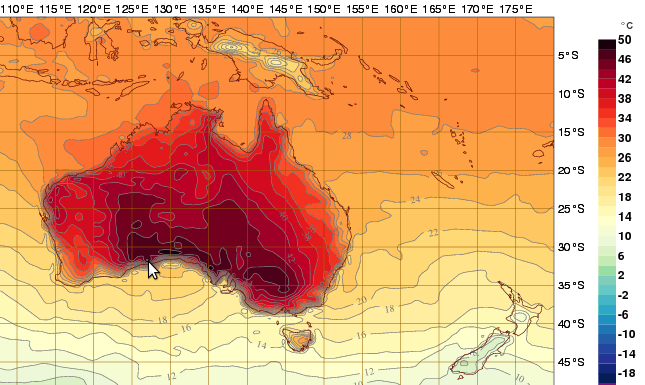 An extreme summer heatwave is forecast to happen from January 3 over a wide area of Australia, particularly central inland areas, lasting for at least a week. "We have a major heat event under way," Karl Braganza, manager of climate monitoring at the Bureau of Meteorology, said. "There are not many instances in the historical record where you get a heat event covering such a large area of the continent." Brett Dutschke, senior meteorologist at Weatherzone, said it was unusual to have so prolonged a hot spell. "It's a once-in-20 or 30-year heatwave event in desert areas," he said. "More populated areas further south … are going to experience some of this as well." "Extreme heat events, such as this one, have wide ranging impacts across agricultural and horticultural sectors, infrastructure and transport, and not least human health and safety. Locations including Alice Springs, Adelaide, Renmark, Melbourne, Mildura, Echuca, Albury, Broken Hill and Wagga Wagga all have temperatures of 40 degrees or higher forecast for today. "Another concern is the amount of vegetation following two wet years, which has led to high fuel loads, that continue to dry out and raise concerns about increased bushfire risk. Fast moving grassfires are of particular concern. "Increasing fire danger is anticipated in southeast Australia with hot and gusty northerly winds, followed by a southwesterly change late on Friday. "There will be some temporary relief from the heat on Saturday with this weak change, moving eastwards over the weekend. “The current heatwave is unusual due to its areal extent. More than 70% of the continent is currently experiencing heatwave conditions. Apart from the required slow moving synoptic weather pattern required for any heatwave, the spatial extent of this event can be attributed to the extent of dry soils across the Australian landscape. "Low antecedent rainfalls across much of the continent (see figure above) along with the late arrival of the Australian monsoon have resulted in drier soils. Without the ability to remove latent heat through evaporation from moist soils, surface temperatures rise above normal, with the daily heating cycle building a deeper body of stagnating hot air over the interior. John Nairn explains in this youtube video from ABC News the issues discussed above. "Fire weather is clearly changing across Australia, with a tendency towards more dangerous conditions being observed across the country. Significant trends in median and 90th percentile FFDI are observed in all seasons, but overall, it is the summer months – the peak of the southern fire season-- that shows the least amount of change. The largest changes are occurring in the spring and autumn, broadly consistent with the model projections. The fire season is lengthening, with an earlier start and a later end. The number of ‘extreme’ fire weather days is increasing in spring, summer and autumn. In a regional sense, the Murray-Darling Basin region is seeing the biggest change in fire weather danger, with significant positive trends observed in all four seasons. In general, the eastern portion of Australia is seeing larger trends in more seasons, but almost every region shows some degree of change." Lucas concludes by saying the possibility of interdecadal variability cannot be ruled out and that "a direct attribution to anthropogenic climate change cannot be made at this time." “People most at risk are those with a chronic disease, such as heart disease, as well older people, children, people taking certain types of medicines, and people engaged in strenuous outdoor activity or physical labour. People who are in the high risk groups should take care during a heatwave and consult their GP about the best ways to manage their condition. “Sweating leads to dehydration, which reduces the volume of blood. This makes the heart pump harder in order to circulate the reduced amount of blood around the body. For people with heart disease and those who are at high risk of a heart attack, these changes can overwhelm the heart and result in a heart attack. “It sounds obvious but is nevertheless worth repeating: animals of all kinds need shade, wherever possible, to protect them from searing sun and wind. Also, they need good supplies of cool water; animals can drink up to double their normal intake during hot weather. ....During hot weather, livestock should be checked daily to ensure they’re coping with the heat. Like humans, heat stress can be fatal for animals. Severe and Extreme fire conditions are forecast for Victoria on Friday 4 January with a total fire ban declared across the state with emergency services placed on alert. Just on New Year's Day when temperatures were warm but not exceptional, there were 60 grass and bush fires across Victoria. Victorians still remember the Catastrophic bushfire conditions for Black Saturday on February 7 2009, when 173 people died due to the fires. Report of a large uncontrolled fire between Portland and Nelson on the Princes Highway, 400km from Melbourne. Also a report on problems accessing the CFA website for fire alert information - capacity problems, evidently. Geez, you would think they would have resolved these issues long before today, especially after 2009 Black Saturday fires! CFA have reported some 49 small fires were dealt with and controlled across Victoria on Friday. There is a small but fast moving fire approaching the town of Ensay in Gippsland. The heatwave extends to Tasmania with a total fire ban declared for the state on Friday. With winds and high temperatures the fire weather is extreme. Currently there is a fire in the Epping Forest that fire fighters are battling to contain. For information on active bush fires visit the Tasmania Fire Service. 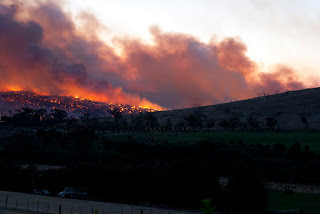 Andrew McGuinness, Tasmania Fire Service acting district officer for state operations told The Mercury newspaper that any fires alight on Friday in south-eastern Tasmania and the upper Derwent Valley would be uncontrollable until conditions abated, probably on Saturday. He said that fuel loads were uncomfortably high in many areas after two relatively quiet fire seasons. "The grasses are starting to cure [dry off], creating a wick for fires burning through bushland to link up," he said. According to Mr McGuinness Tasmania usually endures three days of total fire ban. Friday is the third day this season, with the summer season really only starting. Weatherzone reports that "Hobart has recorded its hottest temperature in 132 years of records, reaching 41.3 degrees today". Reports that winds gusting 50 to 100km/h in the Hobart area. Fire is the major concern. Major Fires have been reported at Inala Road, FORCETT and Dawson Road, LAKE REPULSE. ABC news is reporting the Forcett fire places homes at risk and the fire has jumped the Arthur Highway. The Dawson Road bushfire is burning out of control in the Upper Derwent Valley and is moving towards the community of Ellendale. Latest news is that residents of Dunalley were told to hop onto boats and evacuate to sea. MT @will_ock:This in from Dunalley #tasmania twitter.com/AmyWilliams_94… People were told to hop on the boats and evacuate to sea. Not good. For the Forcett blaze, there are unconfirmed reports of 65 houses and businesses damaged in Dunally and another 15 in Boomer Bay. One unconfirmed casualty which police are investigating. The Arthur Highway is closed with the Tasman Peninsula cutoff by the fire. Mains electricity has also been cut to the peninsula Aurora Energy Tas saying that 4500 customers between Forcett & the Peninsula are without power due to bushfire. Restoration may take days due to widespread asset damage. There is also an Emergency Warning issued for a fire near the Tasman highway near Bicheno on the east coast. Lake Repulse fire front is threatening the communities of Ellendale and Karanja. Lawrenny and Hamilton may be affected early on Saturday morning. Residents have been alerted to enact their bushfire plans tonight. After the first day of Tasmania's devastating bushfires which destroyed over 100 homes and businesses on the Tasman peninsula, the Prime Minister Julia Gillard has announced an emergency assistance package to Tasmanian Bushfire victims. The Insurance Council of Australia has also formally declared the Forcett and Dunalley zone of south-east Tasmania a catastrophe. This means that insurers will establish a taskforce to escalate the industry's response. The emergency measures announced by the Prime Minister include grants for emergency cash assistance, temporary living, essential household goods, and repair and replacement assistance for re-establishment of the principal place of residence. The assistance will be jointly funded by the Commonwealth and the Tasmanian Government under the Natural Disaster Relief and Recovery Arrangements to help alleviate the personal hardship being experienced by individuals and families, said the media statement. ICA CEO Rob Whelan said "It is much too early for the ICA to estimate the cost and extent of the damage, though we have had reports of several dozen homes having been badly damaged or destroyed," Mr Whelan said. "The ICA is liaising with the Tasmanian Government, the Tasmanian Fire Service, State Emergency Service and local governments to get a more accurate assessment." The ICA will be sending a team to the disaster recovery centre to work alongside emergency services, government agencies and community organisations. There are three large fires continuing to burn out of control. The Forcett fire continues to burn isolating the Tasman Peninsula via the Arthur Highway since Friday morning. An estimated 1000 people last night and today were evacuated by boat from the Peninsula, with meals, essential supplies and health workers also being carried in by boat. Property losses have been substantial including many buildings in Dunalley including the school and police station. Other towns affected include Connellys Marsh, where an estimated 40 per cent of the buildings are gone, three houses at Copping and several houses at Primrose Sands. Reports of about 20 houses destroyed in Murdunna and loss of houses in Eaglehawk Neck. Telstra crews have set up generators at Nubeena, Koonya and Dunalley exchanges and are planning to set up a kiosk in Dunalley to assist customers requiring help with temporary service via satellite. Aurora Energy say that there may be lengthy delays in restoring electricity after the fire passes. "It is estimated that in the Forcett fire alone more than 300 poles and scores of transformers have been destroyed, just on the main roads. Much of the electricity supply to the Forestier Peninsula and Tasman Peninsula is via a single spur line, now effectively destroyed by the fire." says a media release (PDF). Despite an unconfirmed report of a casualty Friday night, there are still no confirmed deaths from these bushfires. There are concerns for several missing people. Police and emergency service crew are about to undertake an extensive search in the wreckage of houses to determine if any deaths have occurred. Acting Commissioner Scott Tilyard told a press conference in Hobart that officers were conducting thorough searches of burnt out premises. "They are going door to door confirming there are no people who have died. It is still far too early to confirm that is not the case. We haven't found any deceased people at this stage but there's still quite a lot of premises that we have to go to. It was a very dangerous situation on Friday - a really dangerous and fast-moving fire." Acting Commissioner Scott Tilyard said to the media. A second fire on the east Coast near Bicheno has cut of the holiday town of Coles Bay. There are reports of properties destroyed by this fire, but no towns are currently threatened. A third fire near Lake Repulse is rampaging in the Derwent Valley, north-west of Hobart, near the communities of Ellendale and Karanja. Several properties are believed to have been destroyed and 9530 ha. already burnt. The fire is threatening Lawrenny and Hamilton on Saturday evening. The Tasmanian Fire Service may be using the River Derwent as a fire break, protecting Hamilton. There are reports of a massive bushfire burning in the state's remote south-west National Park at Giblin River between Lake Pedder and Port Davey which has burnt about 30,000 hectares. Because of it's remoteness, the fire is uncontrolled. No communities are threatened by this fire. Victoria is sending a team of 64 fire fighters to Hobart on Sunday, and NSW Rural Fire Service are sending disaster assessment experts. The Tasmania Fire service has been overwhelmed with donation offers. They have requested donations should be made through the Salvation Army (Salvos) and St Vincent De Paul (Vinnies). An appeal has gone out for needing in particular: 1 Money, 2 Blankets/bedding, 3 Toiletry packs, 4 New clothing, 5 Children’s / babies needs. CALL 131 812 to donate. The Australian Red Cross has now launched the Tasmanian Bushfires 2013 Appeal. Australian donations over $2 are tax deductible. Sean Robertson has put together an amazing collection of photos from the Tasmanian bushfires so far in this youtube video, showing the bravery of our Emergency Services personnel, our Firies who risk their lives in battling bushfires to keep the rest of us safe. Set to Shannon Noll's 'Lift' & 'Everybody needs Help Sometimes'. The Extreme heatwave pounced on Sydney on Friday 18 January setting a new maximum temperature record of 45.8 degrees Celsius at Observatory Hill at 2.55pm. The previous high of 45.3 degrees was recorded in January 1939 at Observatory Hill. The temperature had originally been forecast to reach a maximum of 39 degrees, and the low to mid 40s for Western Sydney. 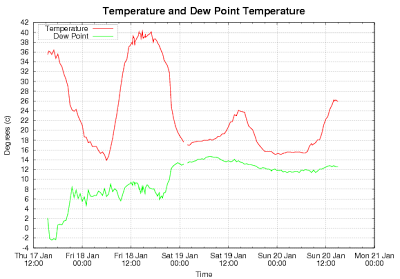 Penrith hit 46.5 degrees at 2.16pm and Sydney Airport hit 46.4 degrees at 2.32pm. The record heat caused multiple failures on Sydney's suburban train system causing severe delays. A fault in the famed Sydney monorail is said to have caused a grassfire to ignite in Ultimo at one point. Meanwhile around the state firefighters battled with several fires out of control fires including the 46,000 hectare bushfire near Coonabarabran that had already destroyed 51 properties, damaged the Siding Spring Observatory and burnt large parts of the Warrumbungles National Park. Assistant Director of Weather Services, Alasdair Hainsworth warned that the coming week could see further serious fire weather conditions in parts of South Australia, Victoria, Tasmania and New South Wales. "As we know, there are serious fires still burning in these states and the coming week will continue to provide a challenge to emergency services even before the severe conditions arrive." he said in a Bureau of Meteorology media release. "Today Sydney, Canberra and other NSW centres experienced extreme temperatures with records being set for Sydney at Observatory Hill (45.8°C); Sydney Airport (46.4°); Canberra (41.6°); and a range of other communities along the coast from Bega (44.6°) to Williamtown (44.8°). The highest temperature recorded in the Greater Sydney Area was 46.5° at Penrith." Canberra also had their hottest January day on record peaking at 41.6 degrees Celsius, just slightly under the all time record of 42.2 degrees Celsius set in February 1968. 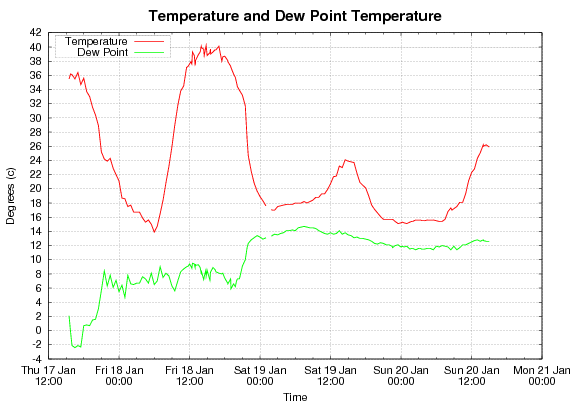 On Thursday 17 January the heatwave hit Melbourne raising temperatures to 40.8, 41.7 at Essendon Airport. A fire started near Aberfeldy on Thursday 17 January in Gippsland in Victoria has now consumed 50,000 hectares destroying at least 9 homes and taking at least one life, a man in a burnt out car in Seaton. Parks Victoria have closed the Alpine National Park and the Avon Wilderness Park. Cooler weather over the weekend has allowed firefighters at Coonabarabran and in Gippsland to build containment lines with back burning. Animation from Australian Bureau of Meteorology (BOM), Interactive Weather and Wave Forecast Maps page.